The phrase "global warming" will appear in a United States "State of the Union" address before 2008/04/01. This address is traditionally given by the President of the United States in late January of each year, although the date may vary. The phrase «global warming» didn't appear in the address from 2 Febrary 2005, 31 January 2006, 23 January 2007 or 28 January 2008. 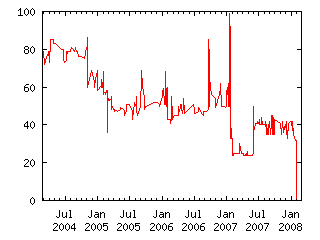 The phrase «global climate change» did appear in the address of both 2007 and 2008, but is not relevant for this claim. I will judge this claim true even if the phrase «global warming» appears in the address on the State of the Union in another context than a simple confirmation that global warming is taking place on earth. This includes denial of global warming on earth, or a proposal to induce global warming on other planets or moons (like e.g. Mars).